As you can tell by the fact that I've placed PSY at #72 in my list with "Gentleman", I have no shame putting "Gangnam Style" in this list. Further proof of my love of PSY is the fact that this music video hit #70 in my Top 100 Favourite Music Videos of All Time. And I know it's a minor spoiler but - this is the second of three PSY songs to feature in this Top 100. "Gangnam Style" was fantastic. Sure, PSY, K-Pop and "Gangnam Style" are all a little bit "out there" for Westerners and some people hate it, or find it to strange or cheesy, but I really, REALLY don't care. If you actually understand "Gangnam Style", about it being about a district in South Korea where people thing they're the bees knees, act in a certain way, dress in a certain way and that PSY is taking the piss out of this culture, then we can all relate. And it's not done in a spiteful way either, more of a parody. 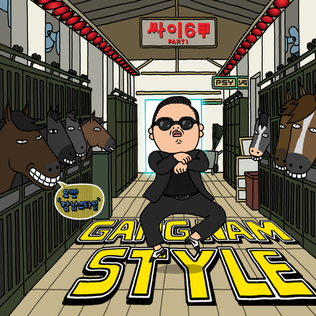 I just love "Gangnam Style" and I even consider it to be a party favourite of mine. If you missed #54 go here.